A stop-work order is a legal device used in the construction industry to suspend work until a decision or an agreement between the contracted parties has been reached. Most government contracts include provisions for stop-work orders, which may be applied in a variety of contract agreements, including negotiated fixed-price or lump sum contracts, service contracts, and research and development projects. Stop-work orders help to minimize the risk of a breach of contract. Stop-work orders typically are included in federal contracts and fall under the Federal Acquisition Regulation 52.242-15, known as the "Stop-Work Order Clause." This can be found under subpart 42.1303 of the FAR. 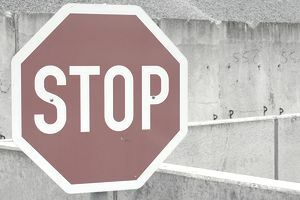 The clause specifies that stop-work orders may be issued for several reasons, including production or engineering considerations or changes in scope. Stop-work orders shall be issued when it is recommended to suspend work, pending a decision from the government or changes in scope that might affect the project duration. Stop work orders shall be issued by top management executives and must not constitute a termination notice. Orders may be issued to stop work when inspectors or an owner representative finds hazardous substances that might harm employees. They may be used to protect other buildings, tenants, or workers from unsafe conditions. Stop-work orders not only are allowed between a general contractor and owner, but they can also be used between subcontractors and their general contractor. Orders may apply to only a portion of the project or some specific tasks. In some cases, remedial work may be allowed to make the site safe or to complete specific elements or stages of a project. Fines may be imposed when stop-work orders are not followed. To lift a stop-work order, a re-inspection might be necessary, and additional costs might be charged to the contractor. A start order shall also be obtained once all faulty situations have been fixed. Written documentation explicitly lists the reason for a stop-work order and the affected areas. It is important to have a paper trail that serves as evidence of all decisions made and all necessary steps that were taken to comply with a stop-work order. Documentation also helps ensure that proper communication is made to all subcontractors. In addition, written records keep track of all costs incurred during the stop-work order process. These help facilitate reimbursement of expenses and aid in completing final accounting.